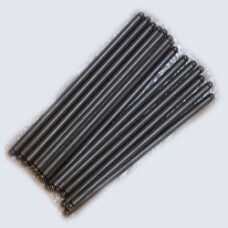 Edelbrock hardened steel pushrods are for use in engines with or without hardened steel guide-plates. Manufactured from casehardened tubing with a surface hardening. Ends welded for maximum durability, 5/16-inch diameter for performance street use. To fit small block Chevrolet (7.800” long).